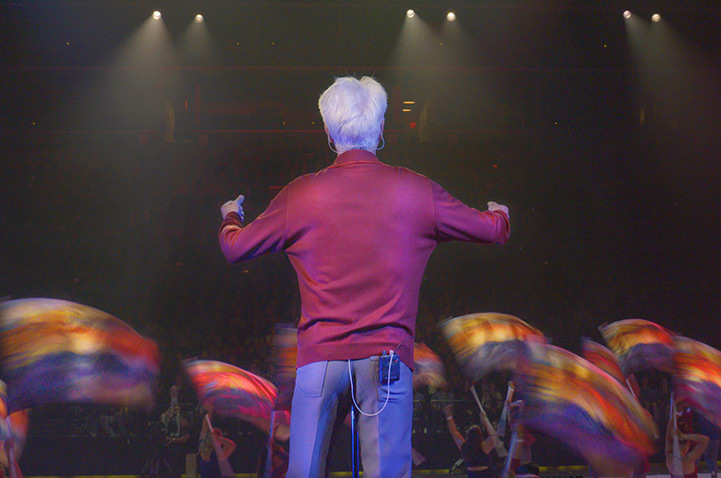 “Contemporary Color” is bookended with the image of David Byrne wandering an empty hallway; in between, it features a series of mesmerizing spectacles that he brought to life. The framing device creates the impression that the kooky Master of Ceremonies has crafted a vivid environment entirely within the confines of Brooklyn’s Barclays Center, where he hosted one of several color guard performances in the summer of 2015. Directed by the ever-innovative documentarian siblings Bill and Turner Ross (“Tchoupitoulas”), who employ a series of cinematic tricks to enhance the experience, “Contemporary Color” is a compelling immersion into that creativity. The Ross brothers make an ideal match for this unorthodox concert film, which finds Byrne curating performances by 10 musicians paired with color guard teams he culled from national competitions. The Ross’ trio of earlier non-fiction efforts — the small town portrait “45365,” the nightlong New Orleans adventure “Tchoupitoulas,” and the border town drama “Western” — each looked at different facets of American life. Here, that focus emerges in the faces of countless giddy, flag-twirling teens suddenly given the opportunity to feel like the center of the universe. As one onlooker observes, their performances “give cheerleading a run for its money,” an assertion to which “Contemporary Color” leaves no doubt. Much of the documentary takes its cues from the eclectic performances, which rarely disappoint. Swords and rifles get tossed around; bodies collapse, jive and fade into the shadows. The event starts with an eruption of frantic expressionism, as the wide-eyed duo Lucius sing “What’s the Use of Crying” while New York team Shenendehowa High School hurtle through a series of Hitchcock-inspired sets. The gears shift to a more contemplative tone with “What Are You Thinking,” a collaboration between Nico Muhly and Ira Glass along with the Connecticut team Alter Ego. Glass and Muhly supply voiceover narration of the performers’ inner monologues as they maneuver about the stage, adding a fascinating multidimensional element to the show. The layered approach continues with a series of behind-the-scenes videos aired in between performances and backstage clamor, which the Ross brothers thread into the story to maintain a constant sense of motion, even in between acts. A surly broadcast reporter hovers backstage, capturing eager performances moments after they leave the stage, still panting and covered in paint. Byrne’s ability to unite young everyday Americans with first-class performers speaks to the egalitarian nature of the proceedings, a grand, jubilant celebration of humanity that transcends traditional social barriers. “Is that one from the Beastie Boys?” asks a young color guard participant to her friend backstage. Indeed he is: Ad-Rock surfaces alongside Money Mark for the boisterous “Quattro Mentos,” while Zola Jesus unleashes an untamed energy of her own with “Something Beautiful.” Dev Hynes’ “Black Watch’ offers a jazzy alternative. In each case, the stage design combines rich lighting schemes with a sea of motion. The Ross brothers (along with main camera operator Jarred Alterman, whose equally hypnotic documentary “Convento” also captured an unorthodox artist) blend cross-fades and superimpositions with slow zooms, reflecting the sensory overload of the production. On occasion, they also cut away, music-video-style, to imaginary scenes far beyond the arena’s walls. While visually astonishing, these scripted bits are also the movie’s weakest link, breaking the illusion of the insular universe Byrne has dreamed up. Ultimately, “Contemporary Color” captures the essence of the event in question with expert craftsmanship, and the filmmaking prowess doesn’t overwhelm the show. At 100 minutes, it runs long, with the momentum rising and falling on the basis of who happens to take the stage. No amount of fancy cutaways obscure the weaker moments. But there’s no doubting that Byrne — and, by extension, the Ross brothers — have delivered an entirely original blend of psychedelic experiences with a realistic window into American life. The ultimate reality check comes from the timing: The show took place just as the Supreme Court ruled in favor of gay marriage, as Byrne acknowledges when he takes the stage for an appropriate rendition of “I Was Changed,” with Les Eclipse. The explosive jubilance enhances the impression of a utopian ideal — pure creativity. The movie’s final shot, of discarded color streams at the end of the night, carries only the whiff of melancholy because it’s a reminder that everything must end. “Contemporary Color” premiered at the 2016 Tribeca Film Festival. It is currently seeking U.S. distribution.